Nasa's Space Weather Prediction Centre (SWPC) said that the energy of the flare had knocked out radio communications on Earth. It led to a 'wide area of blackouts, loss of contact for up to an hour over [the] sunlit side of Earth' and hit systems that are used for navigation, the agency said. Footage of a much smaller solar flare was captured by NASA's Solar Dynamics Observatory just a few days ago. 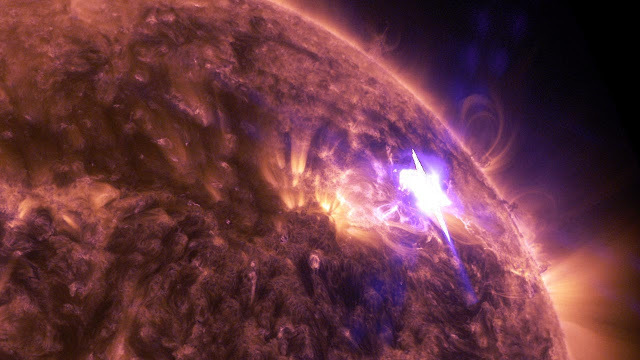 The footage below gives you an idea of what a solar flare looks like. The flare below pales in comparison to what happened today. Thank you for the recommendation. I checked him out and watched his recent video on it. Very interesting. Sorry i have to correct it. Its a youtube channel, this guy never gets excited about the events that he shows. This site is dedicated to watching the sun, and knows exactly what he's talking about. Well this time he actually sounded concerned. Suspicious0bservers youtube channel. I revere this site, but sorry, NASA is one of the biggest and longstanding hoaxes of the I-club. I do not trust one thing NASA says or shows via pictures (i.e., CGI). NASA in Hebrew means "To Deceive" .... in Plain Sight for All to See ... It is a well known fact that the I-club puts their real intentions out “in plain sight” for all to see. BTW, credit is due to Rob Skiba and others for this info, I am just passing along. P.S. Let's see what Irma does or how HAARP controls/ steers it. Will it hit one or multiple US cities? Amazing how God is watching man excel in wickedness, even going as far as bringing calamity and destruction upon fellow mankind. The Bible says God controls the weather (and everything else), but man continues to play God to create chaos in order to bring about a new order of things (i.e., a new world order). Well said C; 100% agree. Just read that the head of the Yellowstone Volcano Observatory stepped down and the article linked to an article about NASA wanting to drill the volcano. According to the article they predicted Yellowstone eruption for 2024. Now we have massive solar flares. Major hurricanes, out of control wild fires. All coming after the eclipse. People can not say birth pains aren't getting stronger. Can you share the article with us? I'd like to read it. Strong's Concordance numbers again? (sigh) I think this risks damaging the credibility of this site. You went to it right out of the gate instead of any scripture. It's akin to using the "Bible code" to predict the future. There's nothing sacred or perfect about Strong's interpretations and arbitrary numbering of words from one translation (the KJv ,which itself is imperfect) out of thousands . Have you ever sought the Lord about this? "Have you ever sought the Lord about this?" Yes. Daily. Often multiple times a day. I also am surrounded by Christian community who pray for me as well. Questioning your wisdom does not equal questioning God's sovereignty. Of course He is sovereign over all. That doesn't mean everything is OF Him. The signs of Jesus' return ,as laid out in scripture, are coming at an headspinning rate. They are powerful enough on their own without adding numbers in movies, license plates, birthdays, baseball scores, etc... But, I leave you to it. I agree you have to be careful and discerning and I take no offense. Sometimes life without coincidence would become meaningless, our lives is not without coincidence, the fact that you are looking at this site is not a coincidence. God is a God of pattern, to some regard as freshly "coincidence". There is a pattern to very message that has been delivered. Is it a coincidence that there are exactly 726 days from the final blood moon to Sep-23, and there are exactly 726 minutes of daylight on this day? God is showing His sovereignty that He alone control the pattern. He created 24 hours a day, and control the planetary movements and He created the author of Strong's concordance and inspire him to write down the numbers. There is even a book of number in the bible. I thought to myself before, it is not hard to get 726 minutes of sunlight on a certain day (12hrs x 60 = 720 minutes) since there are 24 hours in a day, hey, but Only God preset a day to have 24 hours, get it? Good point Kim, and well put! When someone attacks the Word of God by saying it is full of errors they are attacking the very foundation of our salvation. The article I spoke of above was from intellhub.com. I have know idea if it's fake news or not, haven't been able to verify it. An X Class Solar Flare was in the movie Knowing with Knight of Malta Nic Cage; the date of Earth destruction was Sept 23; the intensity of the Solar Flare was "20 Micro-Tesla" or about the strength of a refrigerator magnet. Don't buy the BS; NASA "To Deceive" never went to the Moon; they are staffed by NAZIS Literal SS Schwarze Sonne "Black Sun" worshippers of Saturn. Jupiter is the son of Saturn about to be born on Sept 23. Why X? X means Chi in Greek; the Greek Christ Ares is the UNKNOWN GOD of the Areopagus aka Mars' Hill in Acts 17:23. My Father is a mathematician every thing he created can be confirmed with math how do you think solarium is made if my Father is not a mathematician then the Bible is fake but it is not because my Father created all that Is in the universe. Anyone aware of this already? Anthony Patch does a lot of teaching about how the false god Osiris plays into the end times schemes. Osiris = Nimrod = false Messiah / if you like researching the origin of names and pagan religions there is a stunning book of Alexander Hislop "The two Babylons" free PDF on the web. I read it years ago, very good source. ...Probably worth mentioning at this point, given the discussion around Strong's, that Strong's #2673 (in relation to sunspot AR 2673) is katargeo- to render inoperative, abolish. Or another definition-I discharge or sever. Interesting given sunspot that discharged an X9.3 flare that could render inoperative radio equipment and communication devices. Anybody thinking about precursors to Revelation 16:8-9? Month of Elul prior to Feast of Trumpets? Repentance urgency increasing calls to be expected? There's a new article by Daniel Matson on watchfortheday.org about this too. The timing is not right. The bowls are poured out after the Body of Christ is gone. I does seem to fit for what is happening now though! I'm not a space weather watcher but just happened to stumble upon a YT video by Suspicious0bservers yesterday that describes the powerful X9.3 flare. And he describes the corresponding full-halo CME that is estimated to strike earth tomorrow, September 8 and continue on into September 9. While September 23 is ultimately looked upon as the date of the Revelation 12 great sign, I can't help but wonder if the interim date of September 9 might be significant given that Jupiter moves out of the 'womb' of Virgo as it descends below the line formed by Heze and Spica. In any event, Suspicious0bservers also draws a connection between solar flare activity and earth weather phenomena, especially typhoons, cyclones and hurricanes. The year 2005 is an excellent example. Will the storms present intensify? And there are people who also believe solar activity triggers earthquakes and they point to an X1.5 solar flare on March 9, 2011 that resulted in a CME that struck earth March 10, 2011 and continued on into March 11, 2011, the day an 8.9 magnitude quake struck off the coast of Japan resulting in the Fukushima disaster. There's a lot going on these days. Fires in the northwest, storms in the southeast, solar activity and rumors of wars. ......even have a Book in the Bible called "Numbers", named, of course, after it's Author...just sayin'. With the UTMOST respect for UNSEALED, you provided footage of a much smaller solar flare that was captured by NASA's Solar Dynamics Observatory just a few days ago......is there no footage of the two massive X-class solar flares which just hit earth? Unfortunately that was the only animation I could find.